Romantic Hongkongers are ‘world’s biggest Valentine’s Day spenders’, Belgians and Singaporeans are 2nd and 3rd. 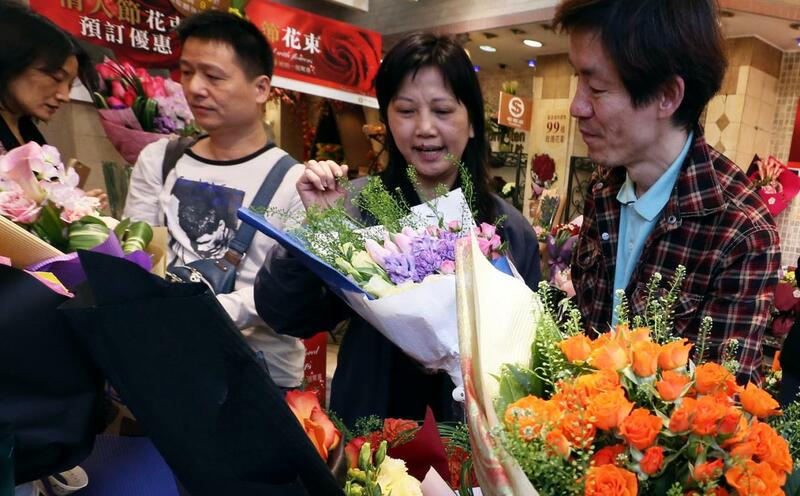 Hong Kong’s romantics have been named the biggest Valentine’s Day spenders in the world. That should make for the world’s happiest florists, but instead, with Valentine’s Day falling on a Saturday, some were complaining about missing out on deliveries to offices. Hongkongers plan to spend an average HK$1,430 to express their feelings to loved ones this year, according to the survey by Groupon which covered 17 countries and territories. Belgians were ready to fork out the second highest figure, while Singapore’s lovers came third. Still, Belinda Ko Yin-ping, marketing manager of citywide chain Brighten Florists, said she was expecting Valentine’s Day takings to drop. 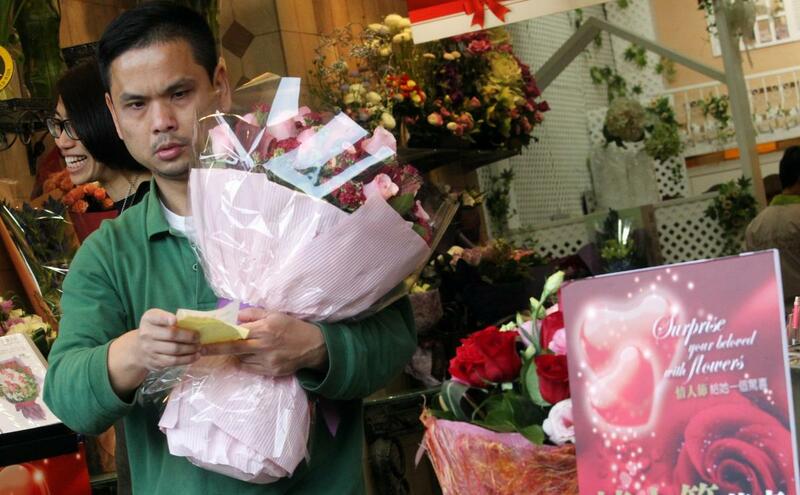 Winnie Chong, of Anglo Chinese Florist in Central, said some bouquets were delivered to workplaces yesterday. She said that had a knock-on effect. “It means we have more chance that their friends will see they’ve received nice flowers – then their boyfriends will also arrange a delivery,” she said. Those sending bouquets will have to fork out more this year, as flower prices have increased by around 5 per cent due to higher rents and delivery costs, Ko said. Ecuadorian roses are the most popular, with the average romantic spending between HK$1,300 and HK$1,500 on bouquets, according to Ko. Johnny Ku, 27, was buying roses for his new girlfriend in Causeway Bay yesterday lunchtime, to be delivered to her at work. “I bought 11 stems because there’s a meaning behind the number that says you’ll love her and she’ll love you for your whole life,” he said, adding that the saleswoman in the shop had suggested the figure. For those wanting to pledge eternal love, marrying on Valentine’s Day this year is not so easy as registries are open half-days only on Saturdays, the Immigration Department said. In total, 207 couples plan to marry today, down from 526 last year when the Yuen Siu Festival, Chinese Valentine’s Day, fell on the same day. Wedding planner Sonya Yeung, of Bliss Creations, said she had not arranged any Valentine’s Day nuptials during her 10 years in the business. “In Asia, it leans more towards lucky days, or auspicious days, for example November 11, 2011. Auspicious dates are definitely better regarded,” Yeung said. ← When fake news goes viral, blame the media. Verify all news before passing it on.